Staining, French Polishing and Varnishing. A practical guide for the amateur and proffesional, including many valuable recipes. With nine chapters on staining, french polishing, varnishing, colour matching and glazing wood and furniture, this practical guide is a must have referance for the amateur and proffesional alike. See below for the full list of contents and chapters for this very useful little Ebook. One feed, its all you need! click here to subscribe to our feed and be the first to know when we add new items. A practical guide Ebook for the amateur and proffesional. "The cabinet-maker and upholsterer between them make stately and artistic furniture in which they may take an honest pride, but they are dependent on the french polisher to give it the beautiful lustrous appearance it assumes when displayed in the showroom. To those who own furniture of any kind- and their name is legion- a mastery of this art may easily become a most valuable asset. By its use a handsome piece of furniture may be made from common wood, and old furniture, drab and lustreless, can be improved out of recognition." Staining: What it is, Variety of stains, Water stains, Recipes for water stains, Floor stains, Glue paint for kitchen floor, Spirit staining, Recipes for spirit stains, Oil stains, Recipes for oil stains, Aniline dyes. Click here to read this chapter. Preparing wood for staining, Putting on the stain, Stippling, General hints for staining. Click here to read this chapter. Overglazing uniform, Colouring, Floor stains, Staining wicker work. Click here to read this chapter. What french polishing is, History of french polishing, French polish and varnish, Various qualities of french polish, The polishers workroom, The polishing rubber, Care of your rubber, Preparing furniture for french polish, Preparing new wood, Stopping, Hard stopping. Beginning the work, Polishing, Bodying in, Bodying up, The pounce bag, Spiriting. 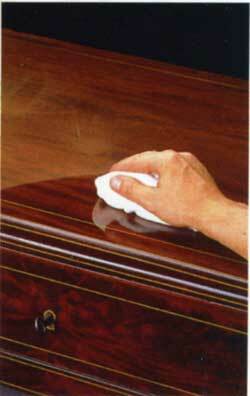 Dry shining, Egg shell gloss, Polishing fretwork, Matching, Stained polish, Removing old polish, Varnish remover. Sweating, Cracks, Blisters, Dullness, Finger marks, Fading, Scratches, Patches, Water marks. Darkening oak, Silver grey oak, Light oak, Wax polishing, Wax polishing floors, Oil polishing. Varnishing woodwork, Varnishing old woodwork, Mems. for varnishers.